Palo Cedro Youth Soccer has postponed the start of the Fall 2018 season until the weekend of September 8th. The delay is due to the Carr Fire and related events. Parents should expect to be contacted by their player’s coach by the third week of August. The Coaches Meeting has been rescheduled for Monday, 8/13/2018 at 7pm. The Coaches Meeting scheduled for Monday, 7/30/2018 has been cancelled due to the Carr Fire. Rescheduled meeting date is TBD. Registration for Fall 2018 is now available. 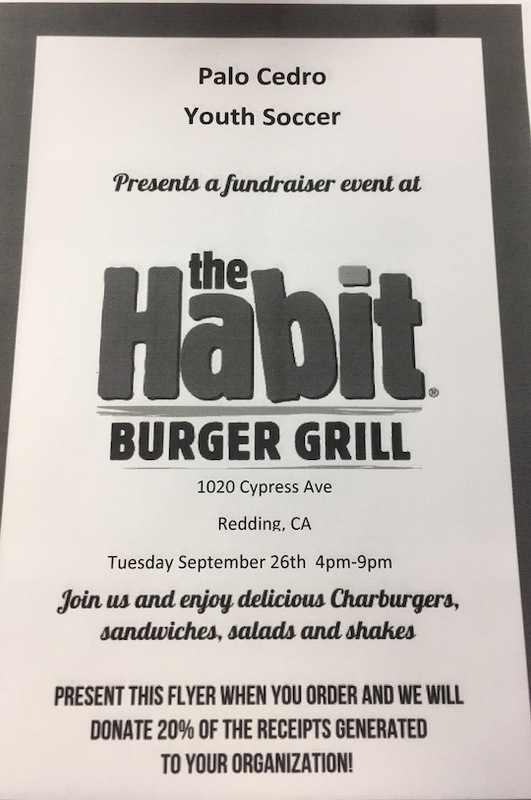 Support Palo Cedro Soccer by dining at the Habit Burger Grill in Redding on Tuesday, September 26th. Present this flyer or display it on your mobile device when you order. Picture day is Saturday, September 16th at Junction School. Please arrive 10 minutes before your scheduled time. Game schedules for all age groups are now available. For more information, visit the Schedules page. Wednesday, May 31st, 5-7pm at Goodtimes Pizza in Palo Cedro. Please come in and sign up. Sign ups will be available online until June 20th. 3. Cash or check for payment.